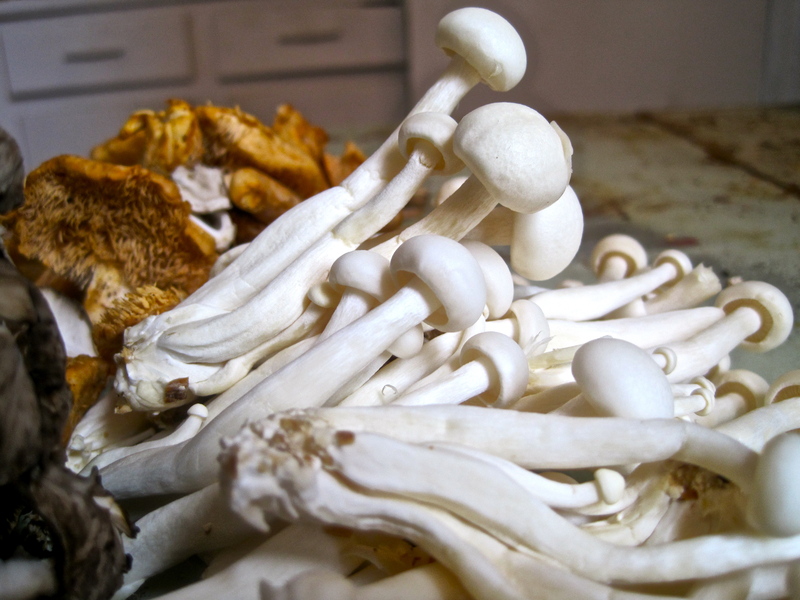 Last week I read an article about a species of mushroom discovered in the Amazon by a group of Yale students which happily survives eating plastic in oxygen-free environments. Leave it to mother nature to solve the problem of landfills when we humans can’t. 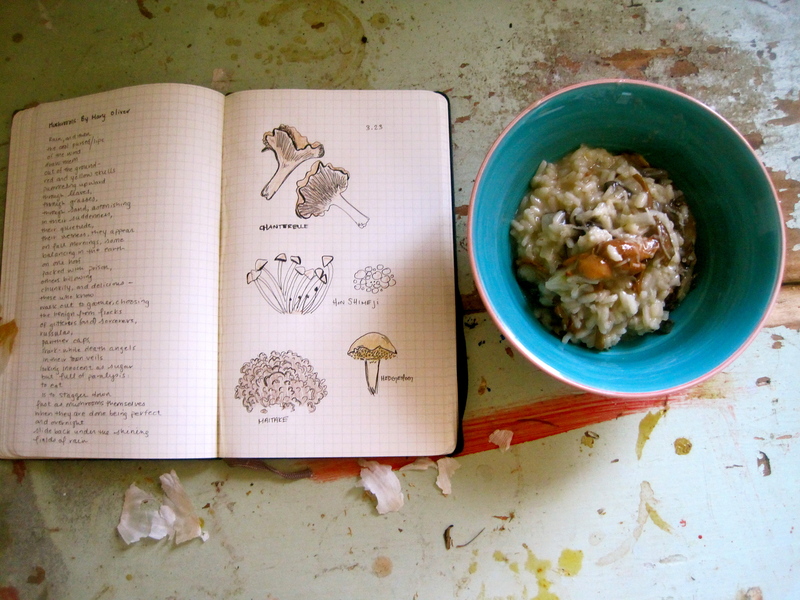 Ever since reading the article I’ve had mushrooms on the brain (no, not like that), so when the girls from Oona-verse contacted me to ask if I would cook them a contemporary poem I knew exactly what poem I would cook. Mary Oliver is known for her naturalistic poetry, and her poem “Mushrooms” is one of my very favorites. 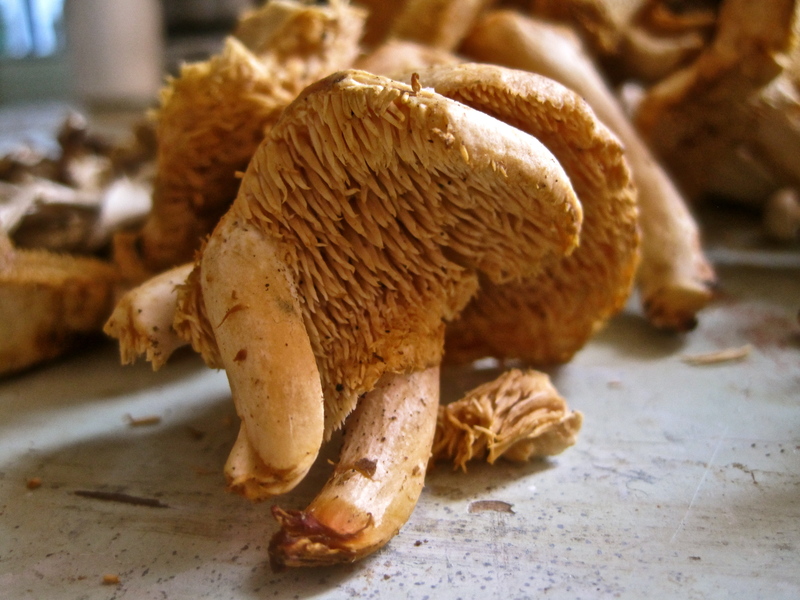 If you weren’t already a mushroom lover this poem will be enough to get your mouth watering for them–even her descriptions of poisonous mushrooms are irresistible. 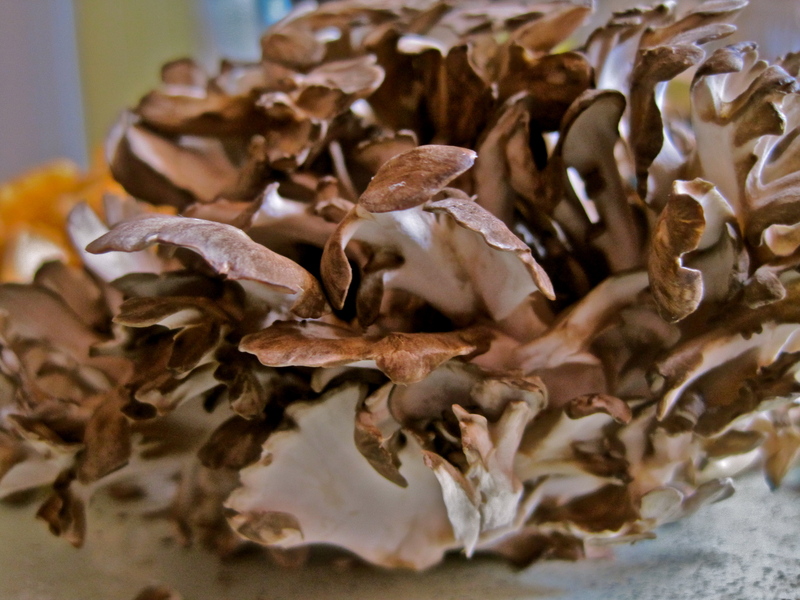 Wild mushrooms are all over the market right now, which made cooking this poem even more exciting. 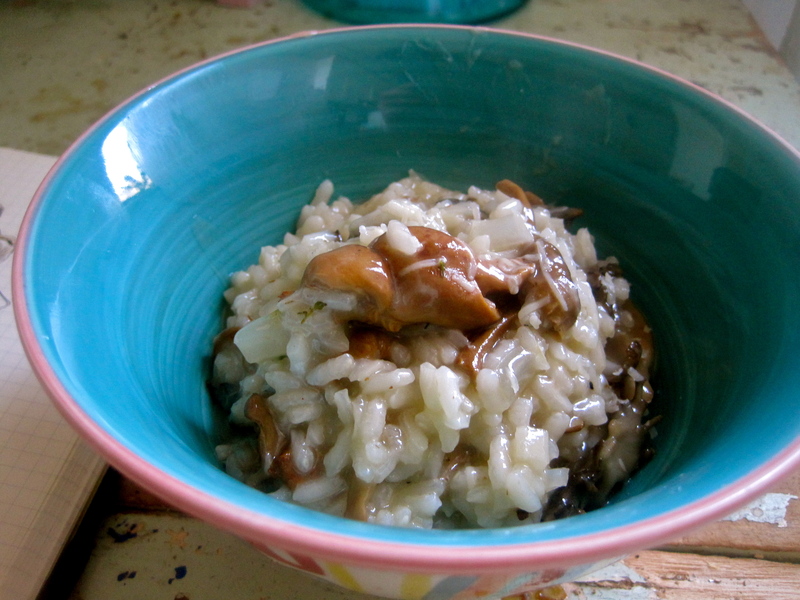 Risotto is a wonderful way to let their delicious flavors sing, it is rich and decadent and comforting and full of creamy, woody mushroom flavor. 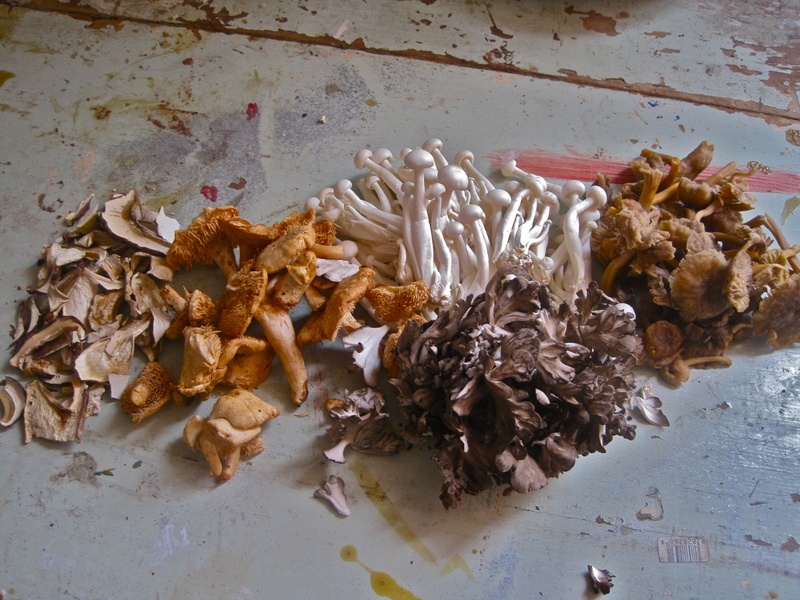 I used Hon Shimeji, Chanterelle, Hedgehog and Maitake mushrooms but feel free to use any that you enjoy most. First, sautee the mushrooms. I did this in two batches because I have a small sautee pan, but also because different kinds of mushrooms will have different cooking times, so cooking them all together can be tricky. 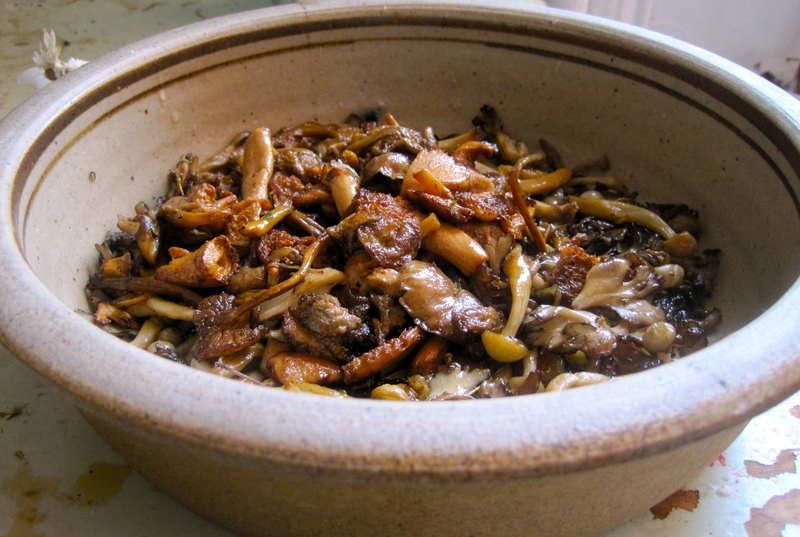 I cooked the hedgehogs and the chanterelles together because they are similar in size and water content. Same goes for the maitakes and hon shemejis. Add a half stick of butter to your pan with about 1/8 cup olive oil and cook until butter is melted. Add two cloves of garlic, crushed, and about 5 sprigs of thyme, then add your mushrooms and cook, salting to taste, until golden brown. 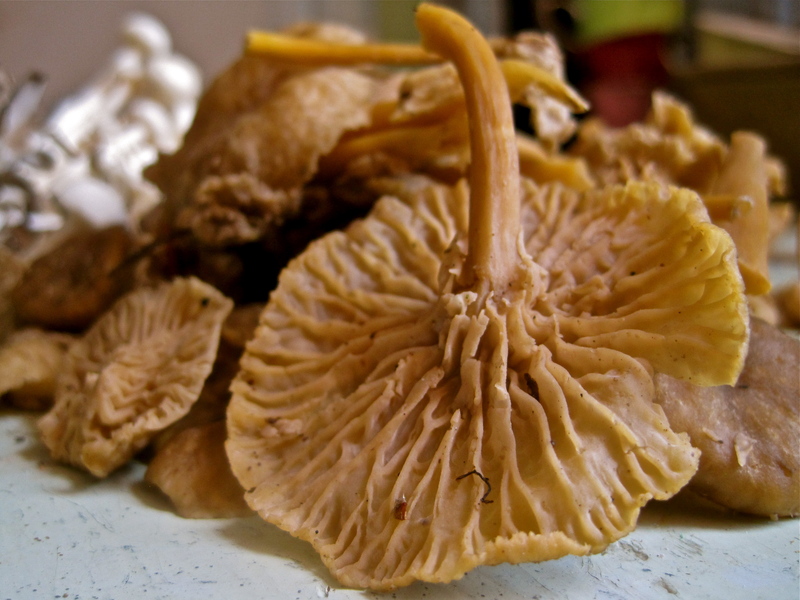 Repeat this with your second batch of mushrooms, but first drain the oil out of the pan and refresh it. Set your mushrooms aside and chop your onion in a medium dice. Toss the onions in a large pot coated with olive oil and cook over medium heat until translucent. While the onions are cooking heat up your chicken broth in a separate pan. Once the onions are translucent and soft, add your risotto rice and toast about 2 minutes. Add white wine to rice and onions and cook, stirring often until wine is absorbed. Begin adding your hot chicken broth in batches and stir frequently until each batch is absorbed. When there is only a little liquid left to be absorbed add in your cooked mushrooms and continue to cook until all the liquid is absorbed and the rice is soft but slightly al dente. Add remaining 2 Tablespoons of butter and 1/2 cup grated cheese and stir until incorporated. Serve immediately with extra parmesan. To take this risotto up a notch, put a soft poached or blistered egg on top.